These are two of the wedding photographers I saw in action on my trip – I saw at least two more that I didn’t capture. All were Chinese – I guess it’s a thing now for Chinese couples to come to famous landmarks ( I saw this in Paris as well when I was there ) to get their wedding photos done. I don’t know if they were actually having their weddings in Rome and Florence, or just getting their pictures taken. I’d have loved to have asked, but the photographers were busy working and I’m not going to interrupt them. 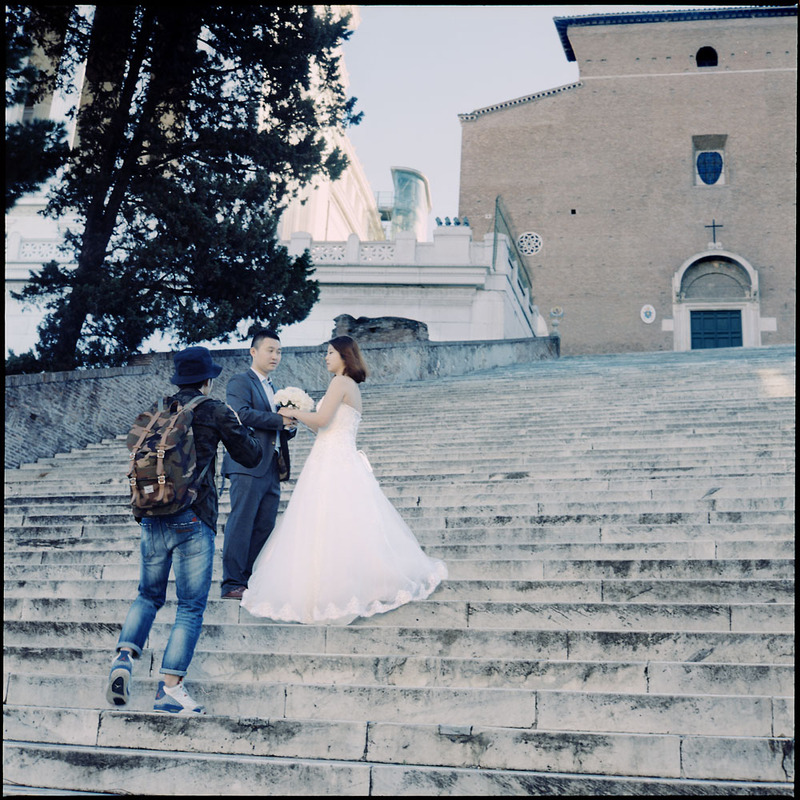 I’m not at all surprised by the first location- the steps of Santa Maria in Aracoeli are a very popular destination spot for wedding couples. They were lucky that it was a quiet day – in peak season the steps are very popular with tourists, including pilgrims climbing them on their knees hoping for divine intercession to heal illness or get pregnant, although not so much these days. There are 124 steps (122 if you start on the right-hand side). 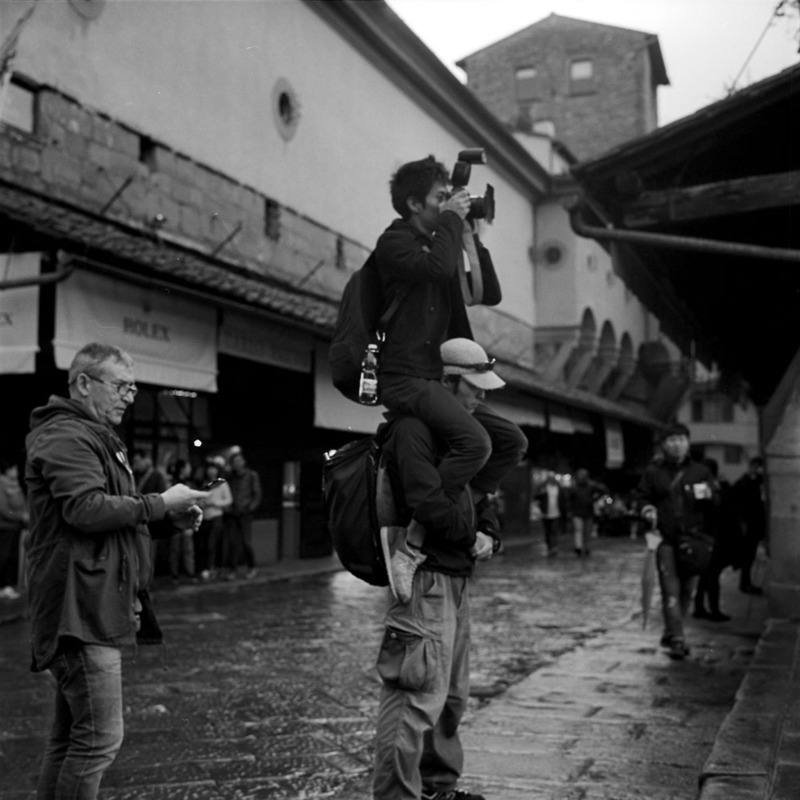 In Florence, this was the scene on the Ponte Vecchio, next to the Cellini monument. I know photographers will go to some lengths to get the shot, but this is really taking it to another level. I also observed a much more conventional photo-taking outside the Duomo early in the morning on another day.